In recent years, terrorism has become closely associated with martyrdom in the minds of many terrorists and in the view of nations around the world. In Islam, martyrdom is mostly conceived as bearing witness to faith and God. Martyrdom is also central to the Christian tradition, not only in the form of Christs Passion or saints faced with persecution and death, but in the duty to lead a good and charitable life. In both religions, the association of religious martyrdom with political terror has a long and difficult history. 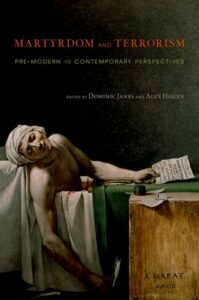 The essays of this volume illuminate this history following, for example, Christian martyrdom from its origins in the Roman world, to the experience of the deaths of terrorist leaders of the French Revolution, to parallels in the contemporary world and explore historical parallels among Islamic, Christian, and secular traditions. Featuring essays from eminent scholars in a wide range of disciplines, Martyrdom and Terrorism provides a timely comparative history of the practices and discourses of terrorism and martyrdom from antiquity to the twenty-first century. Dominic Janes is Reader in Cultural History and Visual Studies at Birkbeck, University of London. In addition to a spell as a lecturer at Lancaster University, he has been a research fellow at London and Cambridge universities. His latest book project is Queer Martyrdom from John Henry Newman to Derek Jarman. Alex Houen is Senior University Lecturer in Modern Literature in the Faculty of English, University of Cambridge, and Fellow of Pembroke College. He is author of Terrorism and Modern Literature, as well as various articles and book chapters on literature and political violence.